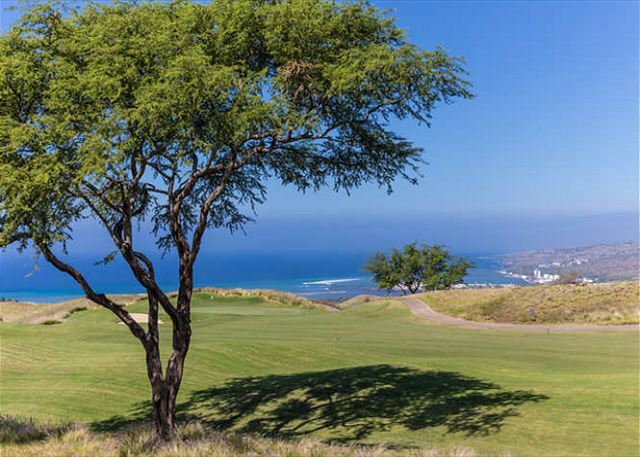 Wai'ula'ula, located on the 'mauka' or mountain side of the highway in the Uplands development, accessed through the Hapuna Prince Resort entrance. 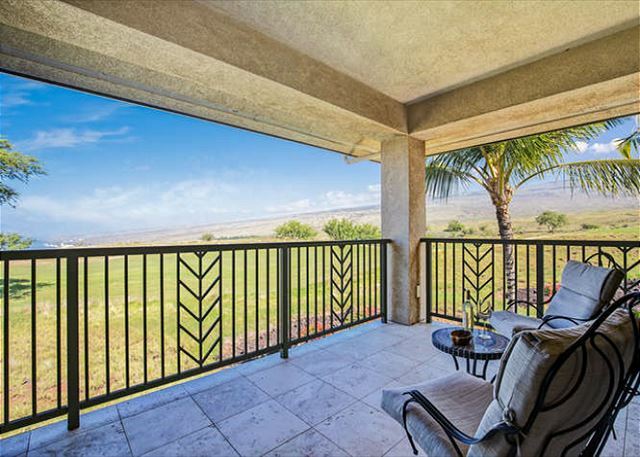 This gated community is surrounded by the fairways of the Hapuna golf course and boasts panoramic ocean and mountain views at an elevation that provides the most pleasant temperature with gentle breezes. 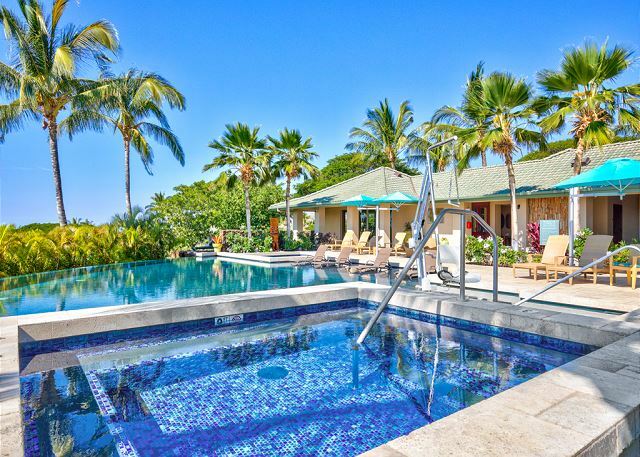 Wai'ula'ula arguably offers the best recreation pavilion of all the resort properties for guests who like a private, spa-like vibe. 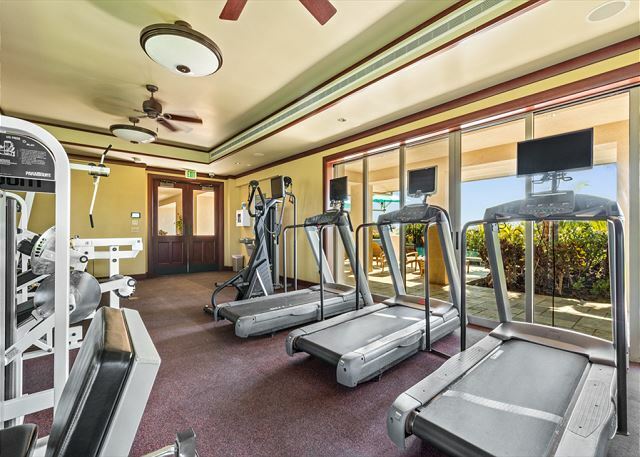 It features its own infinity pool, large hot tub, toddler's pool, fitness gym and spacious BBQ area. It has a natural saline pool that is gentler on the skin than chlorine. 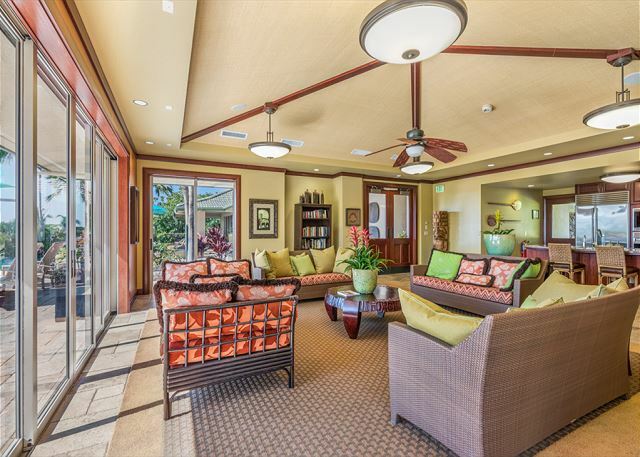 Renting this condo provides you with the option of purchasing full privileges at the Mauna Kea and Hapuna Resorts, reduced green fees at both Championship golf courses and use of the Mauna Kea seaside Tennis complex (consistently rated one of the best in the world) at resort guest rates. 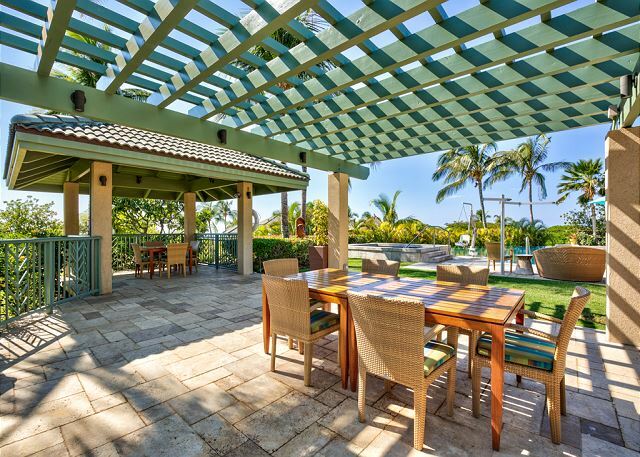 You will have access to pools, lounge chairs, umbrellas and towels at both the Hapuna and Mauna Kea beaches. The Mauna Kea Beach is consistently rated in the top 10 lists by the major vacationing publications. 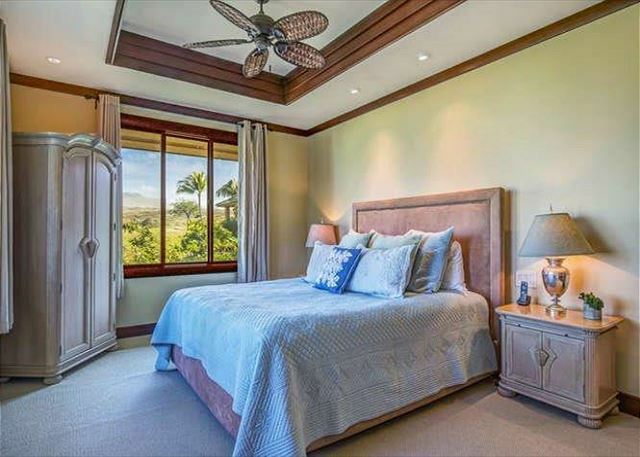 This upstairs elegantly appointed 3 bedroom, 3 bathroom villa has amazing Ocean, Mountain and Golf Course views. 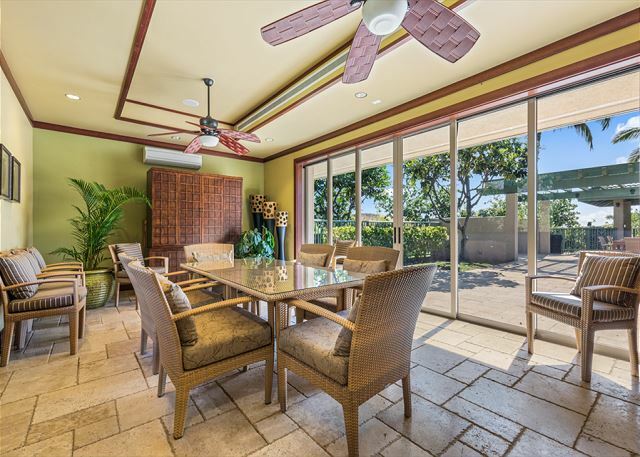 Quiet serenity begins to sink in as you walk through the collapsible wall of glass doors opening completely up to the lanai, providing true Hawaiian indoor/outdoor living. 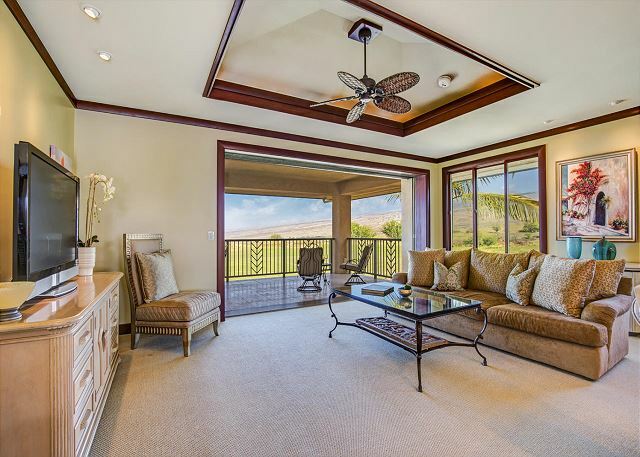 Relax with an exquisite cup of local Kona coffee while taking in the amazing panoramic ocean views- or enjoy spectacular sunsets over the Pacific from the privacy of your own lanai. Even though the villa can be opened up for outdoor living it is also air-conditioned for maximum comfort. 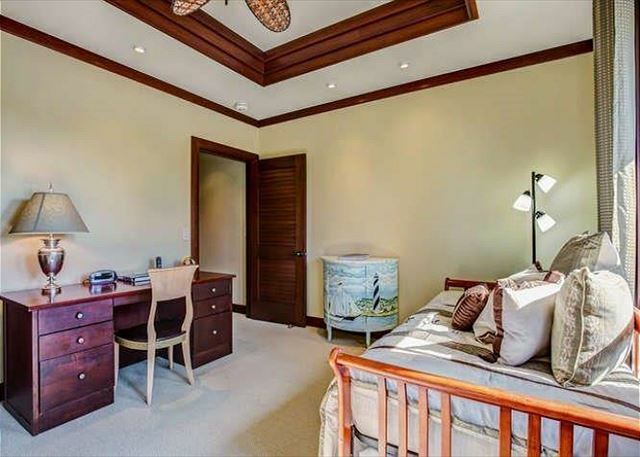 Finished with rich Mahogany throughout, each room features this beautiful wood in the molding, solid doors, and trim. The Great Room and Dining Room feature beautiful coffered ceilings and travertine marble floors. 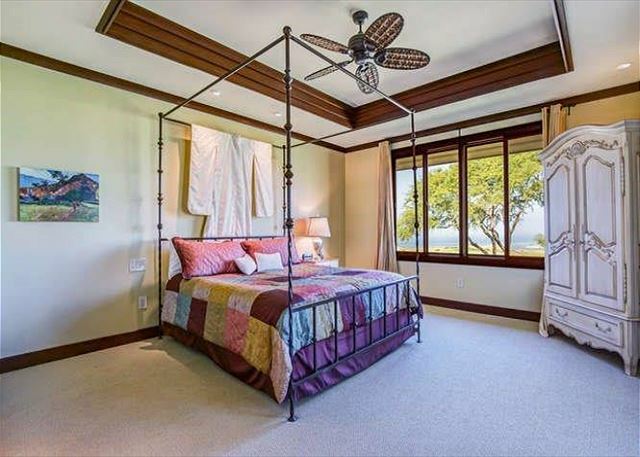 With dual-zone air conditioning and ceiling fans in every room, your comfort is assured. 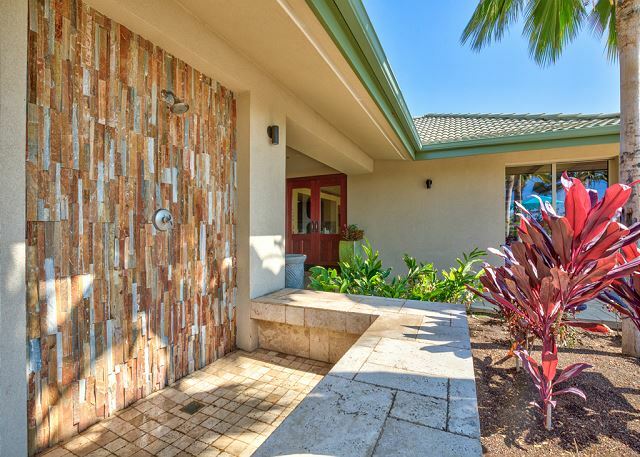 Cherry cabinetry, travertine floors, and granite countertops in the entry, kitchen and baths are all features of the finest in island accommodations. 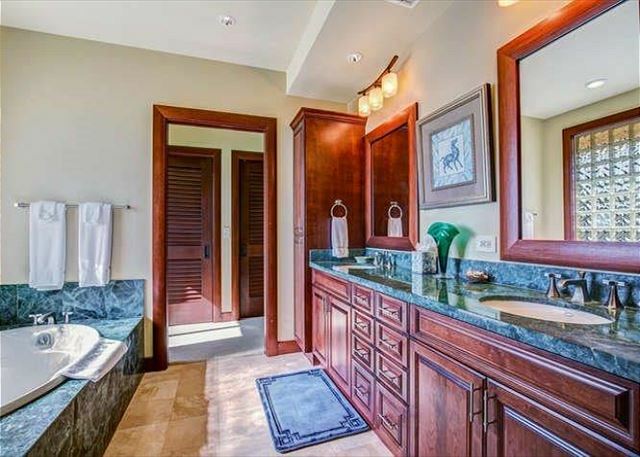 Unwind in the serene bathrooms with soaking tubs, dual sinks, separate showers and enclosed toilets. 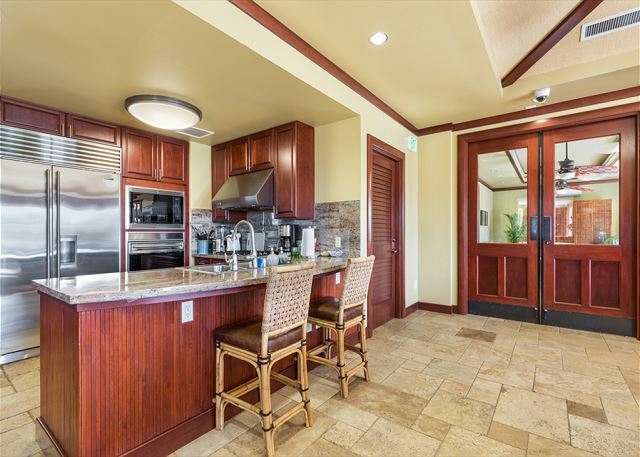 Produce mouth-watering meals in the spacious fully equipped kitchen featuring a 6-Burner Stove, Sub-Zero Refrigerator/Ice-Maker, Granite Countertops and a granite island for casual seating. 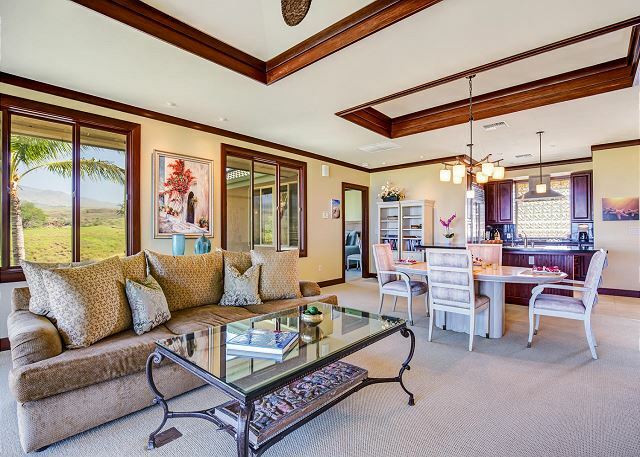 Even though you might find it hard to leave this beautiful villa, it is a great home base to explore the many wonders of the Big Island including Volcano National Park, Mauna Kea Observatory, coffee and macadamia nut farms, artist communities, and more! Rated among the top beaches in the world, Hapuna Beach and Kauna'oa (Mauna Kea) beach are the only white sand beaches on the Big Island and both are only minutes from your doorstep. 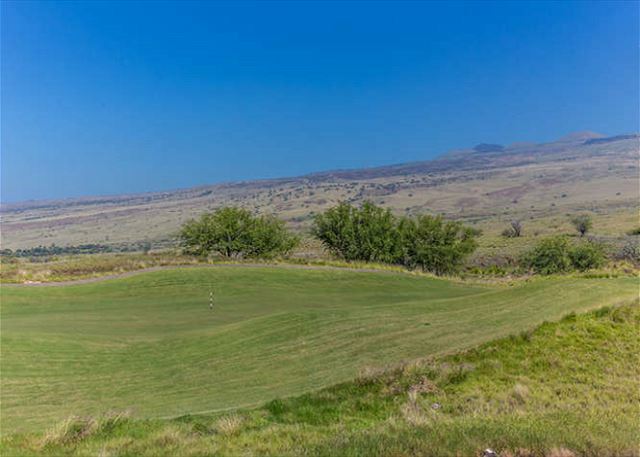 The Waikoloa Beach Resort located about 15 minutes away is known for its two championship golf courses, restaurants and shopping. 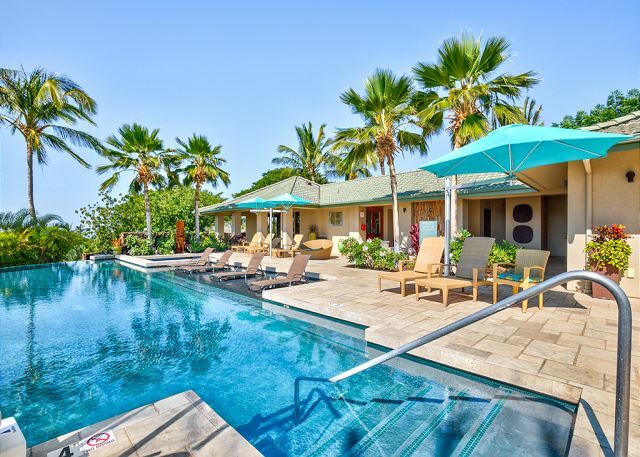 The beautiful Anaeho'omalu Bay is in a protected cove and has a beautiful sandy swimming beach with lounge chairs under the majestic palms trees and offers sunset and dinner cruises, paddle boarding, kayaks and snorkeling. There are two shopping centers; Kings Shops and the Queens Market Place that offer an array of upscale boutique shopping, fine dining restaurants and fast food cafes along with a grocery store. 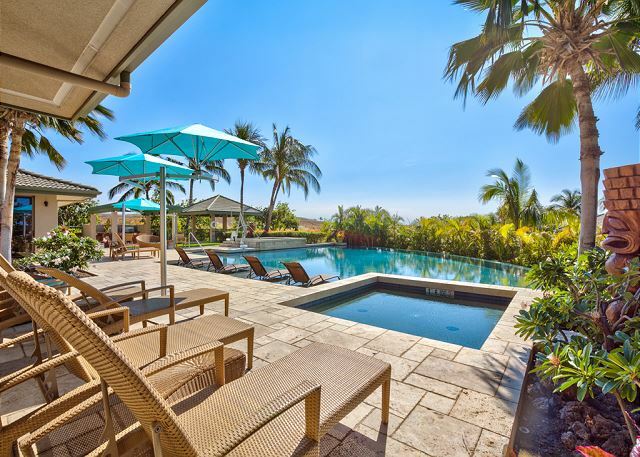 The feeling of relaxation you experience will remain with you long after your stay, beckoning a frequent return. Great location and views! Good value for the area. 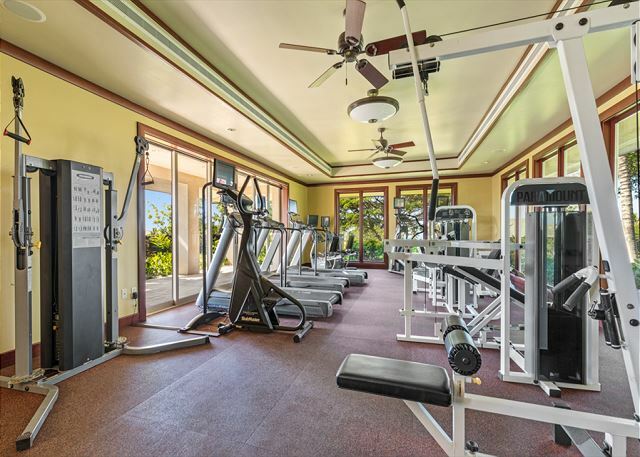 The condo was well located and generally well maintained. The outdoor furniture was sparse and in less than pristine shape. It was quiet and the neighbors were pleasant. Thank you for the constructive feed back regarding the patio furniture, we will bring that to the attention to the owner in hopes more will be added. 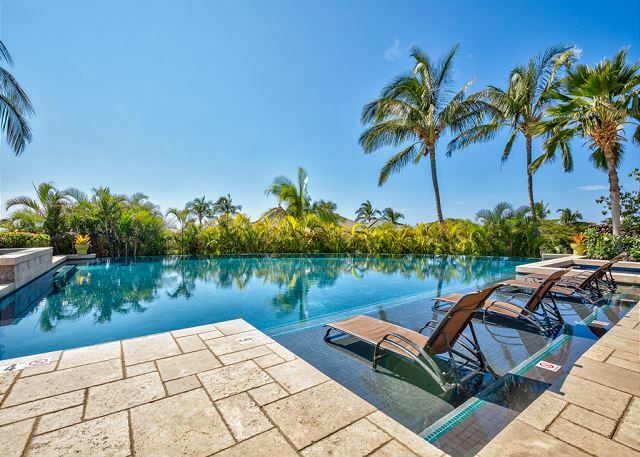 This vacation villa perfectly suited our needs. 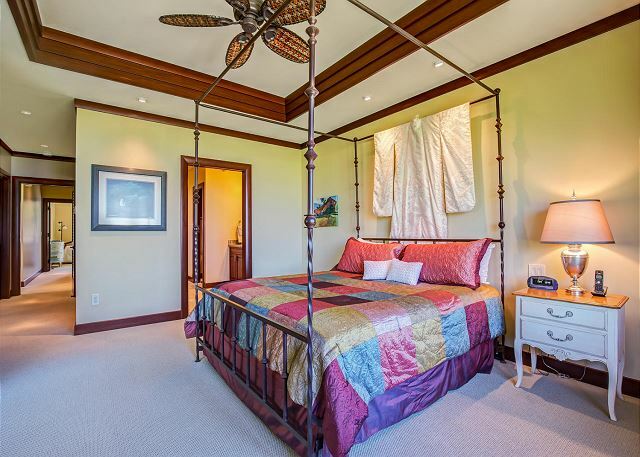 Two huge Master suites and the third bedroom that slept 4! We had a wonderful Christmas stay. Loved the complex pool and amenities. the grounds are gorgeous. Coffee on the lanai in the morning with the most amazing view. We are ecstatic to hear you enjoyed your stay with us! I'm sure future guests will find this review helpful during the booking process. We encourage you to return and take advantage of our returning client discount! Our stay at the above unit was fantastic. We were close to most of the beautiful beaches, the unit was clean and well appointed. A bit of a drive to the Kona area but we were fine with that. We had easy access to anywhere on the island. Boundless Hawaii were very professional and responsive. Only thing missing at our unit was a BBQ. Would definitely recommend this unit and management company to friends and family.